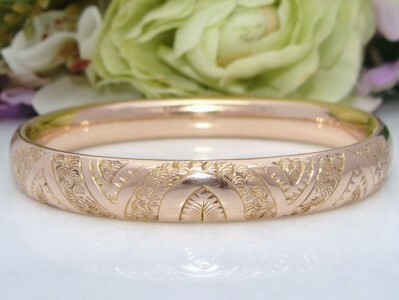 In Absolutely Pristine condition is this Stunning Antique Rose Gold hued bangle bracelet of the Highest Quality. The design is hand-tooled, the crafting of which has created beautiful detail & depth with a slight embossed effect. Foliate and geometrical stretch from near clasp to hinge with a smooth, patterned finish to the background; it is Simply Exquisite and the pictures provide the description - just magnificent! The superb craftsmanship is unlike that seen today with the mass produced, machine made jewellery. The back and interior is plain & smooth. It is an oval shape so it can be worn comfortably as a cuff bangle or loose on the wrist. Its “hidden hinge” and push button clasp (with an internal sliding bar as a security feature) is functioning perfectly! The gold has a warm, rose hue and the colour in the pictures is true-to-life. It has that silky smooth feel usually only associated with solid carat gold which is to be expected of quality antique jewellery. Trademark: F.M.Co. for its maker, Finberg Manufacturing Company, established in 1888 and renowned for their high-end, superior quality pieces including bangles, bracelets and lockets. This is no exception! MINT Antique condition! It is obvious is has NEVER been used – I received it in a box which is where I believe it had spent its whole life. There is no wear, dents, repairs or damage to mention – the gold is pristine! It is just Stunning on the wrist and you will be thrilled with this purchase. Guaranteed!